While I was doing lens testing yesterday of the Nikkor 35/1.8S and 24-70/4S lenses on the Z7, I had a devil of a time with manual focusing on the Siemens Star target. I think part of it was the focus-by-wire (FBW) firmware in the camera. Back in the NEX-5 days, FBW was pretty lousy with the Sony MILCs, too, but they’ve improved a lot. Nikon seems to have a long path ahead of them to come down that learning curve. But I also noticed something that seemed just plain weird: the image seemed to change focus after I’d stopped turning the ring. Could it be latency? You’re looking at the back of the Z78, which has the 35/1.8 on it. The camera is aimed at an ancient Tektronix analog oscilloscope — this won’t work reliably with a digital one. There’s a function generator set to a high frequency, with the amplitude the full vertical scale of the ‘scope. I set the time base to 50 milliseconds per division, or half a second to traverse the entire screen. I set the Z7 to maximum magnification and adjusted the distance do that the ‘scope screen filled the finder. 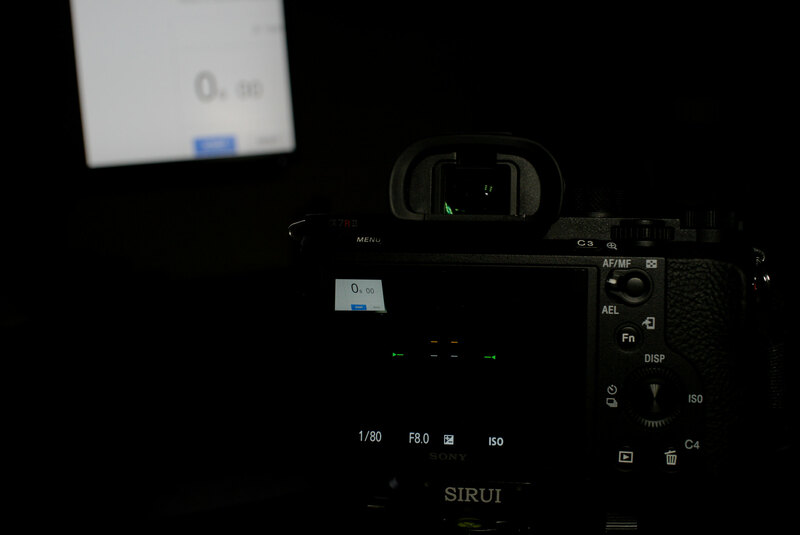 Then I turned off the room lights and took a picture of the back of the camera and the ‘scope screen at the same time with the Nikon D850, which takes about 3 milliseconds to make an exposure. The exposure itself was 4 msec long. 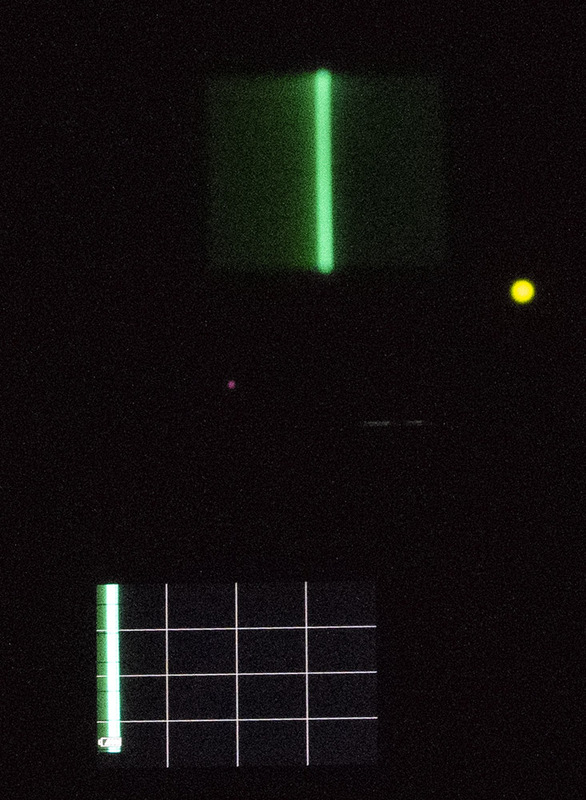 The trace on the ‘scope is almost to the middle of the screen, but the image of that trace on the camera’s LCD is about at the one-division line. 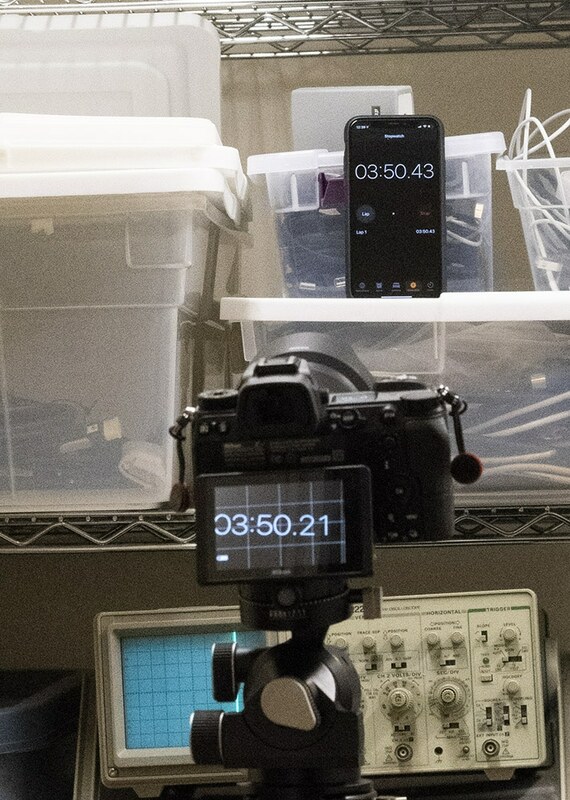 That means that what the camera is displaying is about 200 milliseconds behind real time. In this case, the oscilloscope has completed the pass that is shown on the camera screen, has started another one, and is a bit over 100 msec into it. The bright trace on the camera back is thus about 200 msec behind. However, the dimmer trace is from the previous refresh of the LCD, and is another 50 msec behind. 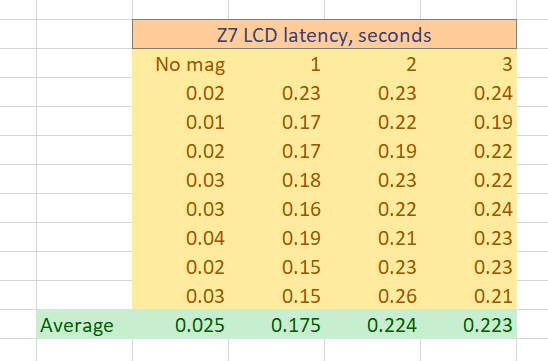 Thus the latency of the Z7 LCD in fully-magnified mode is between 200 and 250 msec. I’m assuming that it’s about the same in the EVF, but I don’t have a way to measure that. About what we got with the ‘scope, and I trust these numbers more. If the d8 function changes the latency, it doesn’t change it by much. 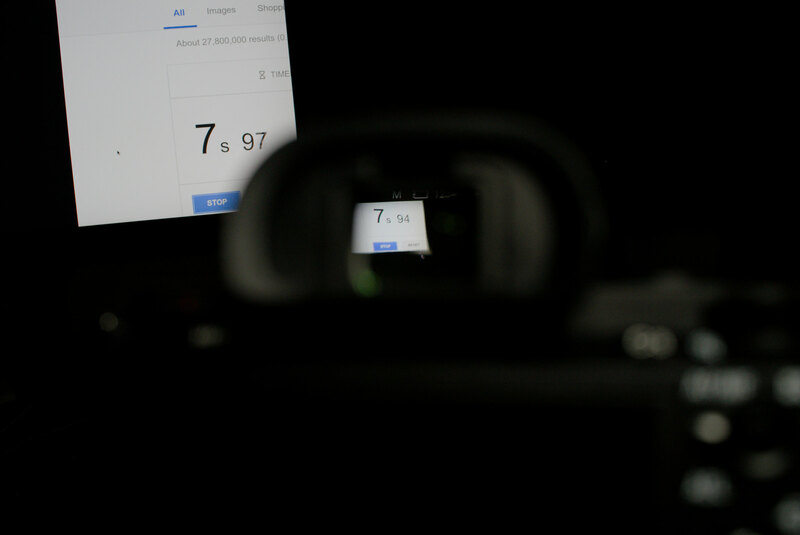 Latency is quite low at no magnification, about 25 msec, but adding magnification, even a little, makes things much worse. Peaking does not affect the results. 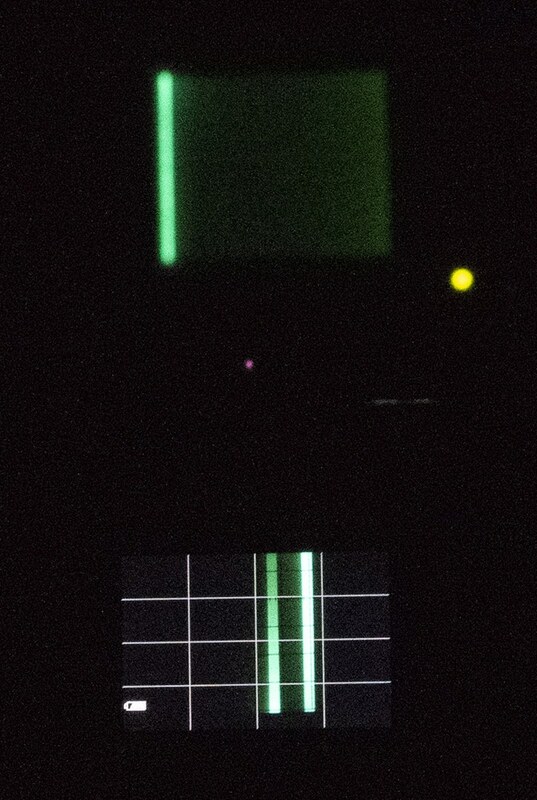 And, by the way, I figure the latency of the image in an optical finder in a DSLR is about 100-200 picoseconds. There’s no magnified view, though. Can either of these methods resolve the latency when not zoomed in? I think they both probably can. 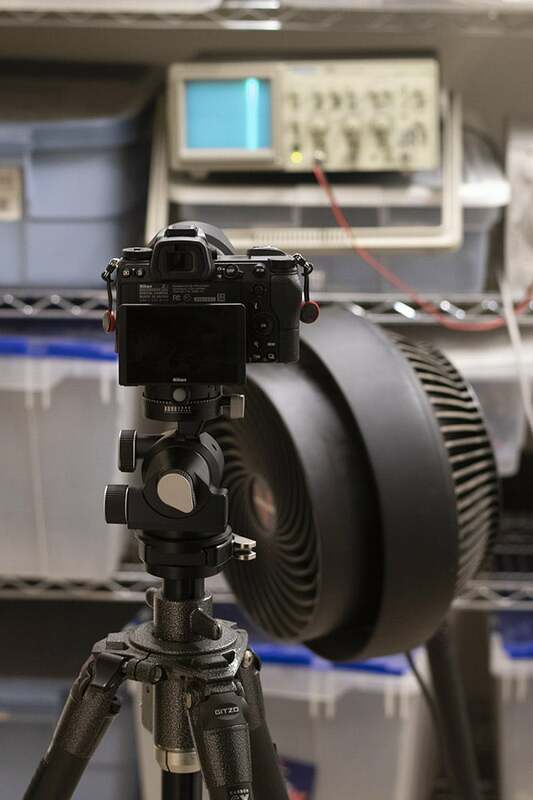 An ultra wide angle lens may help you test the latency of the EVF. Good idea. Tried it, and I’ll need a wider lens for the Z7. FTZ is on the way, and when I get it, I’ll try again. In the first sentence of your second paragraph, you typed “You’re looking at the back of the Z78” instead of “Z7”. Me again. In that second paragraph you also have, “I set the Z7 to maximum magnification and adjusted the distance DO that the ‘scope screen filled the finder.” Did you mean, “…distance SO that the `scope…”?